Built around 1873 for W.H. Loyd, a prominent Lynchburg tobacco merchant. The house remained in the family until 1941. 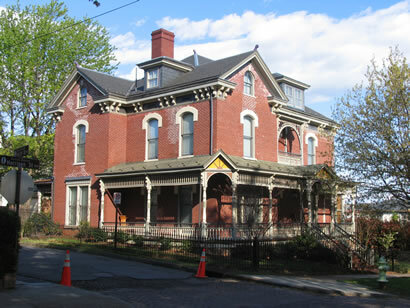 A blemd of Italianate Vernacular and Stick Style, many features are attributed to architect R.C. Burkholder. The third floor was added at the turn of the century as was the servent's quarters, main kitchen and wine cellar which completes the rear wing of the house. There are 20 rooms in the house. The house was converted into four apartments in 1941. The house was vacant from 1972 and condemned in 1978. At one time it was slated for demolition. However, the house was rescued in 1983 and has undergone major renovations.